We Welcome all hikers and hope you will join us for our upcoming hikes below. 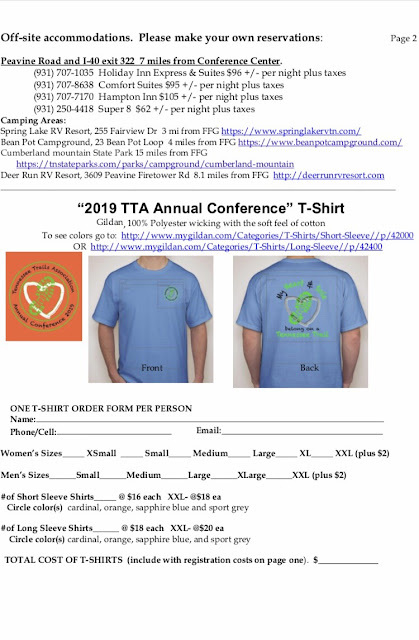 Membership is not required however If you want to join go to this website http://www.tennesseetrails.org/index.php?page=mmbrsp_paypal and fill out the form. Annual membership is $25. 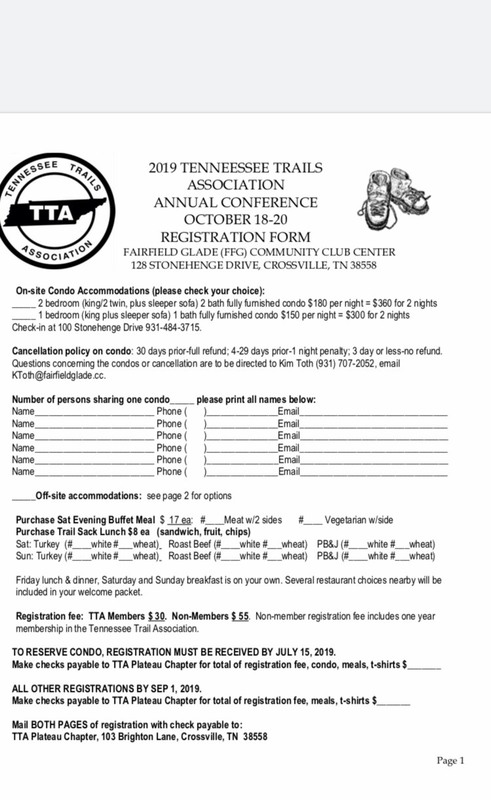 Or print off the form and bring it and a check made out to Tennessee Trails Association to one of our hikes. Chapter Chair is Bruce Whitehead trailwalker80@gmail.com, 941-716-3620. Mark your calendar for this trip. Send email request to plateauhikes@tennesseetrails.org for the complete itinerary. Minimum of 7 and maximum of 12 participants, on a first come first serve basis. Please feel free to visit our web site as well, www.HikingBigBend.com. Tell them you are with the TN hiking group. Get your reservation in by OCTOBER 1, 2019. The flight to/ from El Paso, TX is NOT included in the price of the trip. Hotels, meals, river trip, fees, interpretive information packet, and transportation are all included. This is fully guided and is an interpretative trip with topics such as medicinal and edible plants, cultural history, geology, and off-grid living. APRIL 2019 SCHEDULED HIKES. Wear orange it’s turkey hunting season. Apr 19 - Trail Maintenance. We will meet at the Black/Brady Mountains Trailhead on HY 68. We will split into 2 groups : one will work Black Mt to the campground while the other works Brady Mt Overlook to Lost Overlook. Brady Mt volunteers meet at 7:30. Black Mt volunteers meet at 8am. Bring loppers, saws, clippers and swing blades. And lots of water. For info contact Tim Case binikisfun@gmail.com. Apr 24 – Wedneday – Private Land Hike near Bon Aire, TN. We will be exploring private property in the old mining community. This will be about a 4 mile hike to a waterfall and coal mine and wildflowers along the way. Depart 7:30 am from Tractor Supply on West Ave. Carpool cost is $4. Don’t forget tick/bug spray and sunscreen. Pack water, snacks. For additional information contact the hike leader Howard Owen, 931-248-3190, owenshb@charter.net. Apr 27, Saturday – Smokie Mountains National Park - Long Hike: 7 moderate miles making a loop on Little River, Husky Gap and Sugarland MT Trails. Short Hike: In and out 4.8 easy miles on Little River Trail. Depart 7 am CT from Outlet Mall, Interstate Drive, west parking lot. Carpool cost is $10. Don’t forget tick/bug spray and sunscreen. Pack water, snacks and lunch. We will stop to eat dinner on the way home. For additional information contact the hike Leader Cheryl Heckler (931) 200-7436..
May 8 – Wednesday – Private Land Exploring, Pine Orchard, TN. Hike 4-6 miles on old roads to the site of n old homestead. We'll also venture off on some logging roads in search of a rockhouse and spring. Bring a sack lunch to eat on the trail. Depart 7:30 am CT from Southwest parking lot of the VF outlet mall on Interstate Drive. Gas reimbursement $4.00. Don’t forget tick/bug spray and sunscreen. Pack water, snacks and lunch. For additional information contact the hike coordinator, Deb Westervelt, at plateauhikes@tennesseetrails.org or text/call 931-267-2243. May 10-12 Spring Weekend Getaway – Our Spring weekend getaway to Lake Guntersville State Park in Alabama. The Park has a restaurant/lounge, lodge, cabins, chalets, golf course, cave, cascades, waterfalls, beach, fishing and the Screaming Eagle Zipline. Oh my! Plus 31 miles of trails if we have time! Nearby is the Space and Rocker Center, Cathedral Caverns State Park, Bucks Pocket State Park. It's approximately a 3 hour drive to the Park. So on Friday we will hike the 3.5 mi round trip Point Rock Trail with a 70' waterfall in Bucks Pocket State Park on the way to Lake Guntersville. So on Sat and Sun our options are to hike, visit the Caverns or tour the Space and Rocket Center, golf, fishing, or experience the Zipline. Depart 7:30 am CT from Crossville Trinity Tabernacle HY 127S. Carpool cost is $20. Don’t forget tick/bug spray and sunscreen. Please let the hike coordinator, Deb Westervelt, know you are going at plateauhikes@tennesseetrails.org or text/call 931-267-2243. May 22, Wednesday – CT Daddys Creek Section Trail, Hebbettsburg, TN. Long Hike: This will be a 7.5 moderate mile thru hike along Daddys Creek, past a 1940s cave house once home to a family for years. Requires an 8-mile shuttle. Short Hike: Starting from the Keyes Rd Trailhead to the connector trail yellow gated parking area is 4.7 moderate miles. Depart 7:30 am CT from Southwest parking lot of the VF outlet mall on Interstate Drive. Gas cost is $3. Those in the Fairfield Glade area may join the caravan at 7:45 am at the 4-way stop at the intersection of Peavine Road and Stonehenge Drive. Carpool cost is $2. Don’t forget tick/bug spray and sunscreen. Pack water, snacks and lunch. For additional information contact the hike coordinator, Deb Westervelt, text/call 931-267-2243 plateauhikes@tennesseetrails.org. NOTE 1: Check Blog the Evening Before hikes and/or Early Morning on hike day; It May Be Necessary To Change/Cancel some hikes. NOTE 2: Hike Information - contact Deb Westervelt at plateauhikes@tennesseetrails.org or 931-267- 2243. Leadership—Wednesday hikes are leaderless. Unless otherwise announced there are usually hikers familiar with each hike, so we rarely get lost. But each hiker is responsible for his own safety, maintaining contact with the rest of the group, etc. Hike Difficulty—Hikes typically range from 5-10 miles. There is usually a lot of elevation change and rugged terrain. Neighborhood walkers and inexperienced hikers will find nearly all our hikes difficult. More experienced hikers accustomed to climbs of thousands of feet in the Smoky’s would place most of our hikes in the moderate to difficult class. Hazard—Hiking is not “a walk in the park”. Hazards exist on all our hikes. They range from high cliffs, steep rock scrambles, falling icicles, stream crossings, just to name a few. These hazards are so commonplace they are rarely mentioned in the trail descriptions. Supplies and Equipment---Hiking boots are recommended for all our hikes. Several of our hikers wear snake proof gaiters. We have lunch on the trail. Drinking water is mandatory to prevent dehydration, leg cramps and other complications. Failure to bring adequate food and water is a hazard and an imposition on other hikers. Other discretionary items include compass, pocket knife, first aid supplies, etc. Gasoline reimbursement---We car pool to trailheads typically a half hour to 2 1/2 hours from Crossville. Riders are expected to pay for the gasoline. Drivers incur wear and tear on the vehicle and risk that it may be damaged. Since the riders’ contribution varies with mileage and gas price, cost is decided before each hike, and indicated on the Blog. (Typical gas costs vary from $2 to $12 per person depending on driving distance.) Please bring extra shoes to avoid tracking mud into vehicles. Trail etiquette---Experience has taught us that bad things happen when individuals separate from the group. Time and energy is expended looking for separated hikers even if it turns out they have not missed a turn. Therefore, each hiker should maintain eye contact with at least one other hiker. Small goups should maintain eye contact with the rest of the group. At least one hiker from the main group needs to be informed of bathroom breaks and other delays so that individuals don’t get separated. The group doesn’t split up unless there are extraordinary circumstances (eg, worn out hikers take a short cut). Under those circumstances there must be at least two hikers in each group and a clear understanding of the obligations of each group for driving arrangements or waiting at the trailhead. Hike Pace---We normally hike around 2.5 mph depending on terrain. Practical experience indicates that this pace keeps us together pretty well. However, individual preferences vary with respect to desired time spent at a waterfall or other scenic highlight. There is no silver bullet for resolving these differences other than courtesy. Photographers and others who want to take a closer look need to be sensitive to the will of the majority as do the get-down-to business hikers. Since we spend a lot of energy and time to see sights that can not be seen from a car, ties should be broken in favor of the sightseers. Liability---Bad things can happen on hike: auto accidents,injury,equipment damage or failure, etc. Our group does not assume any collective or individual liability for any such mishaps. Each hiker is individually responsible for his own safety. Punctuality---Zero tolerance. We leave the car pool location promptly at the time announced on the Blog. Hunting season---Hike plans are formulated to avoid the worst of the hunting hazards but, we cannot avoid all exposure to hunters. Therefore it is each hikers responsibility to dress in blaze orange or other bright,visible clothing during hunting season.